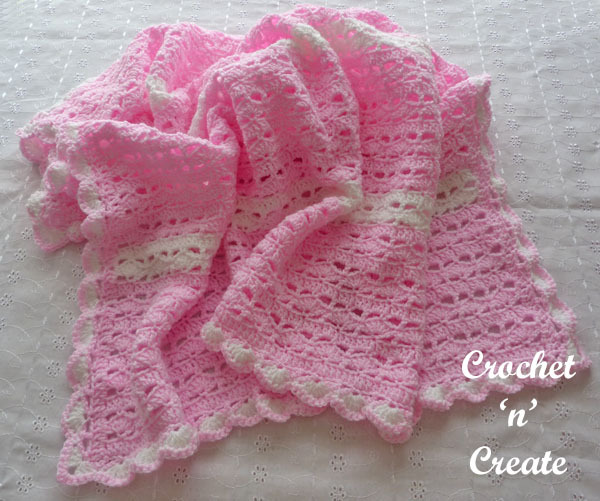 See more of my free baby blanket crochet patterns by clicking on the links below. # # 2nd Row – ch6, skip 2dc, * 1sc in next dc, ch3, skip 2dc, 1dc in next dc, ch3, skip 2dc * rpt from * to * to last 3dc and ch3, 1sc in next dc, ch3, skip 2dc, 1dc in top of ch3. Turn. 4th Row – ch6, * 1sc in centre dc of 5dc, ch3, 1dc in sc, ch3, * rpt from * to * end. Turn. Rpt from # # to # # three more times. You should have 24 complete patterns (all 4 rows) worked in all. DNT. Blanket Edging – Working down first side of blanket with RS facing, ch3, skipping all the sc row ends, work 2dc in remaining row ends to corner. 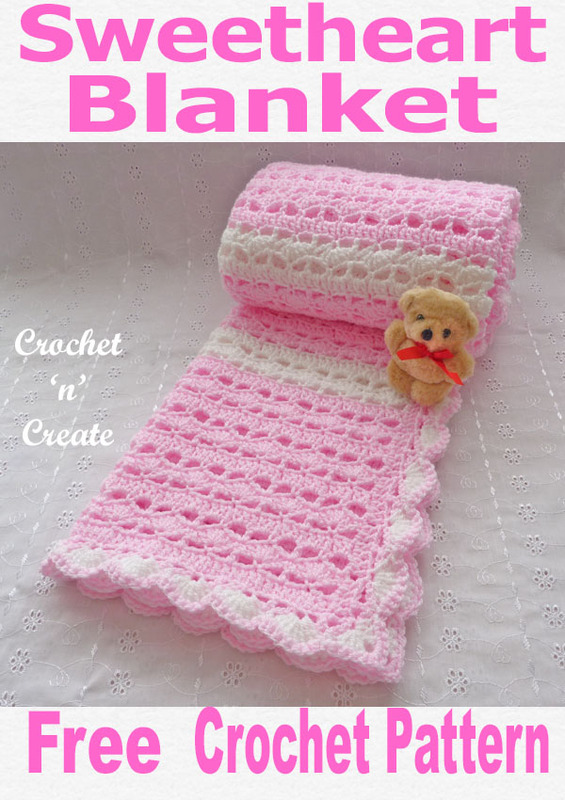 With RS facing join color 1 to opposite side of blanket and rpt second side the same as first. 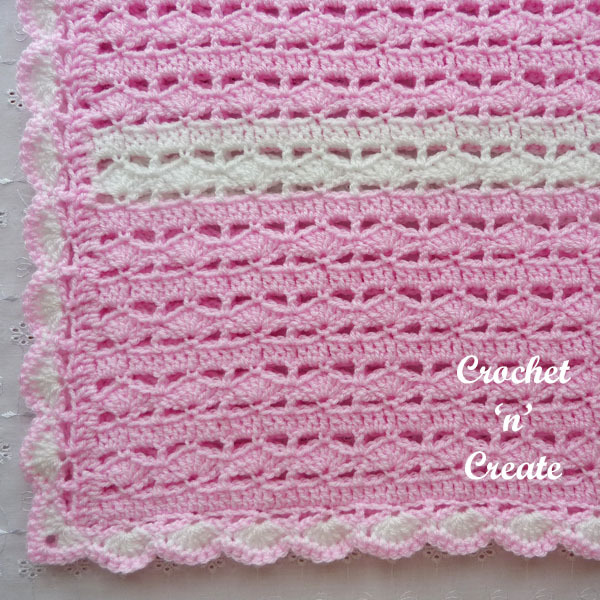 Next Row – With color 1 and WS facing join yarn to top of ch3 on corner working along top of blanket, ch1, 1sc in base of ch1, ch3, skip the 2tch, work 1dc in next dc, ch3, * skip 2dc, 1sc in next dc, ch3, skip 2dc, 1dc in next dc, ch3, * rpt from * to * around the 4 sides of blanket making sure you work a sc in each corner to last 2dc, skip 2dc, sl st to first sc. Turn. Group Row – ch5, 3dc in base of ch5, * skip ch3 space, 1sc in dc, skip ch3 space 7dc in next sc, * rpt from * to * down first side of blanket to corner, (3dc, ch3, 3dc) in corner, rpt from * to * along starting chain edge to next corner, (3dc, ch3, 3dc) in corner, rpt from * to * up second side of blanket to corner, (3dc, ch3, 3dc) in corner, rpt from * to * to last corner, work 2dc in corner, sl st to 3rd of ch5. Turn. Work 1 row of 1sc in each sc to end, working (2sc, ch2, 2sc) in ch3 spaces on each corner. Finishing – Sew in and tie off all loose ends. Optional – Decorate with ribbon and rosebuds. # # 2nd Row – 6ch, miss 2tr, * 1dc into next tr, 3ch, miss 2tr, 1tr into next tr, 3ch, miss 2tr * rpt from * to * to last 3tr and 3ch, 1dc into next tr, 3ch, miss 2tr, 1tr into top of 3ch. Turn. 4th Row – 6ch, * 1dc into centre tr of 5tr, 3ch, 1tr into dc, 3ch, * rpt from * to * end. Turn. 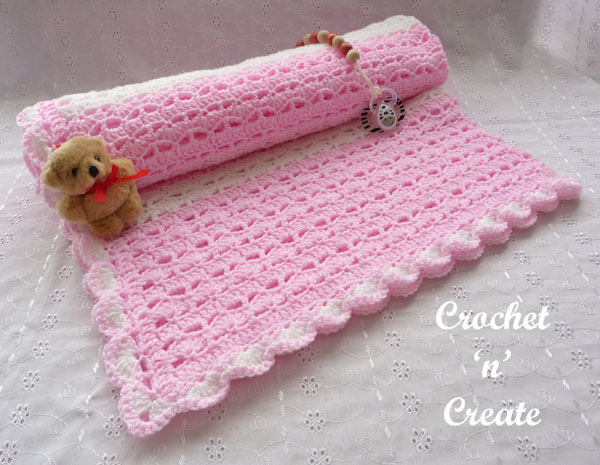 Blanket Edging – Working down first side of blanket with RS facing, make 3ch, missing all dc row ends, work 2tr into remaining row ends to corner. 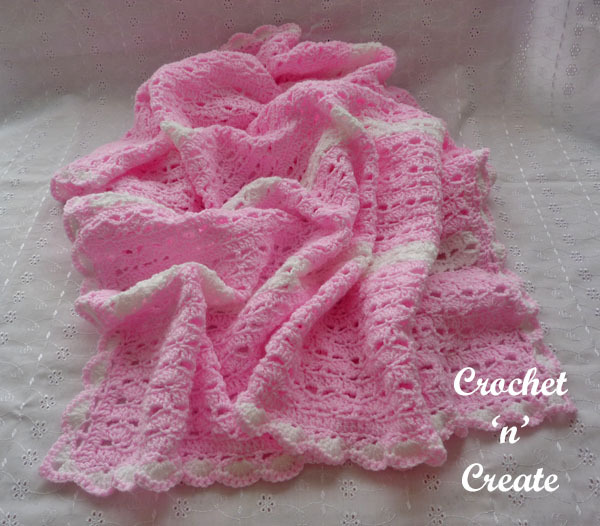 With RS facing join colour 1 to the opposite side of blanket and rpt second side the same as first. 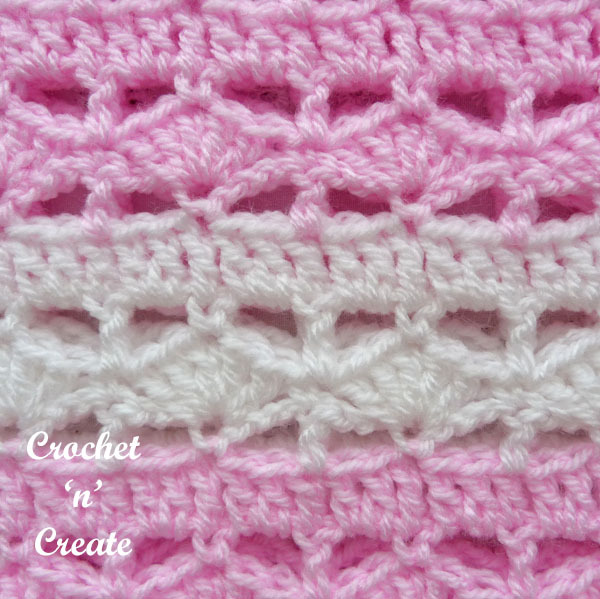 Next Row – With colour 1 and WS facing join yarn to top of 3ch on corner, working along top of blanket, work 1ch, 1dc into base of 1ch, make 3ch, miss the 2tch, work 1tr into next tr, make 3ch, * miss 2tr, 1dc into next tr, make 3ch, miss 2tr, 1tr into next tr, 3ch, * rpt from * to * around the 4 sides of blanket making sure you work a dc into each corner to last 2tr, miss 2tr, ss to first dc. Turn. Group Row – 5ch, 3tr into base of 5ch, * miss 3ch space, 1dc into tr, miss 3ch space 7tr into next dc, * rpt from * to * down first side of blanket to corner, (3tr, 3ch, 3tr) into corner, rpt from * to * along starting chain edge to next corner, (3tr, 3ch, 3tr) into corner, rpt from * to * up second side of blanket to corner, (3tr, 3ch, 3tr) into corner, rpt from * to * to last corner, work 2tr into corner, ss to 3rd of 5ch. Turn. Work 1 row of 1dc into each dc to end, working (2dc, 2ch, 2dc) into 3ch spaces on each corner. 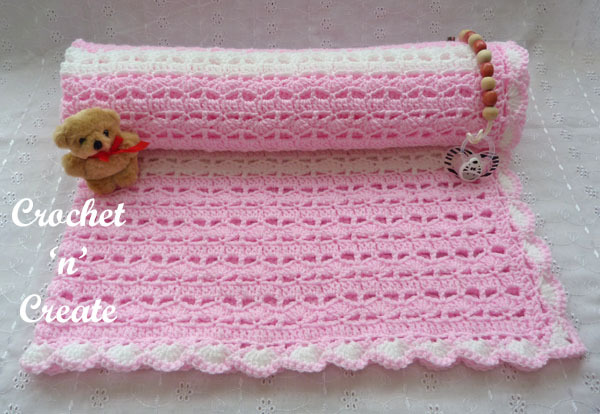 If you wish to print the pattern text only of the crochet sweetheart baby blanket, select the content you want to print, click file (top left corner on browser), then print, this should take you to your printer settings, choose selection and then OK. 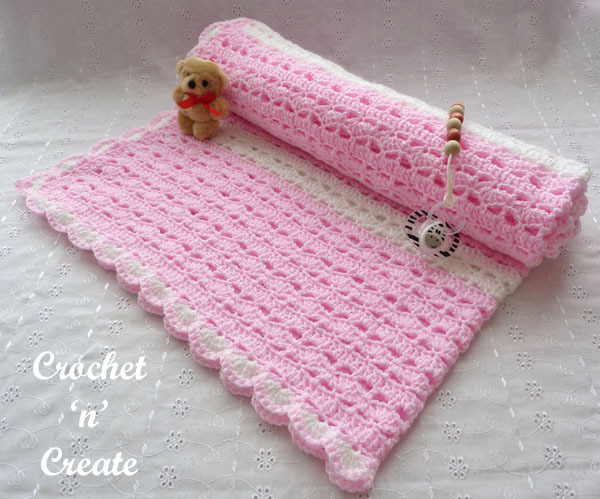 The written instructions and pictures for this sweetheart baby blanket free crochet pattern are copyrighted to crochet ‘n’ create © 2019.
sweetheart baby blanket free crochet pattern, I just ask that you please use your own pictures and put a link back to crochet ‘n’ create.